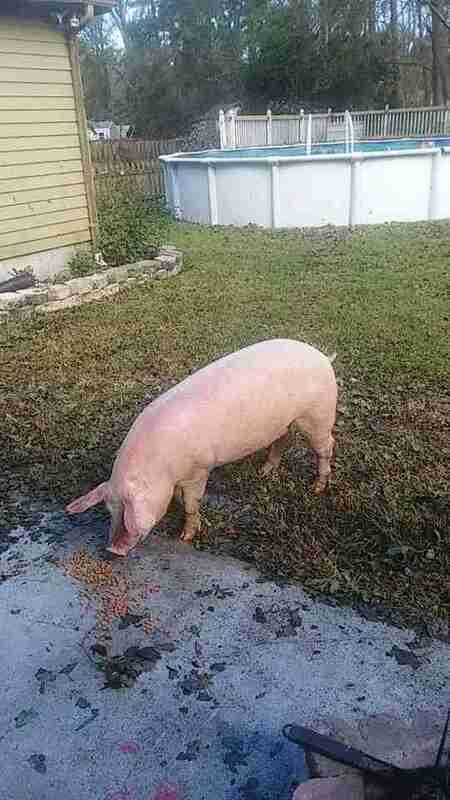 On Monday, everything changed for 20-year-old Josh Walls when he walked out of his house in North Carolina and saw a pig scampering down the road. 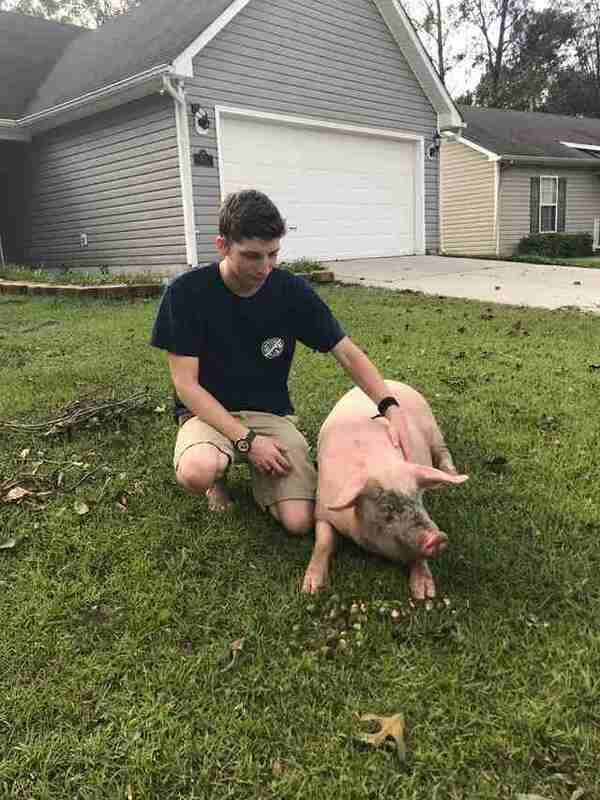 Hurricane Florence had recently flooded the region, and Walls had seen a lot of unexpected things in the last few days, including alligators and snakes in the nearby floodwaters — but the pig threw him off guard. The pig made a beeline for Walls, and Walls wasn’t sure what to do. 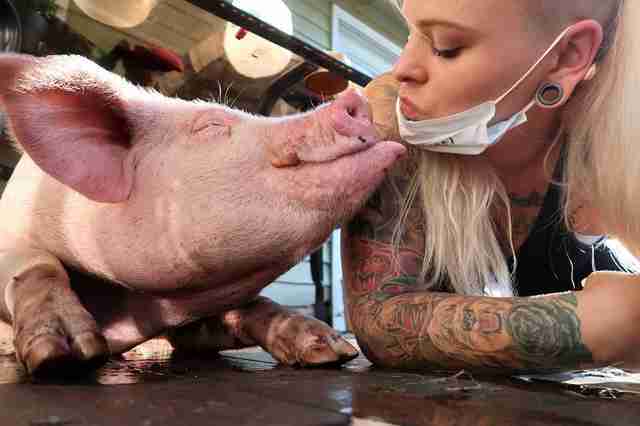 Walls quickly figured out that the pig was extremely friendly, and that he’d been through something horrific — he was sunburnt, and his lungs seemed to be filled with water. It turned out that a nearby factory farm — one that breeds pigs for pork production — had been engulfed in the floods. 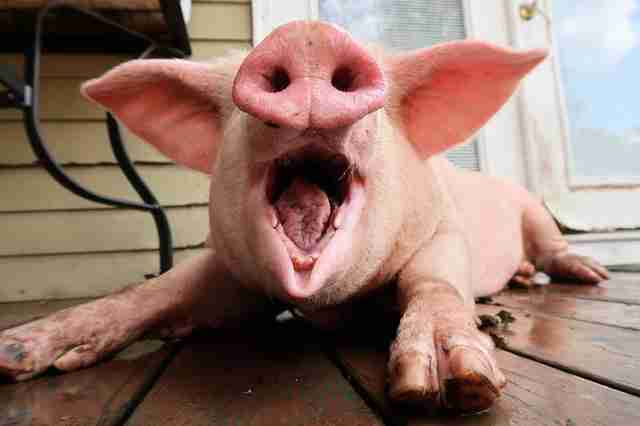 At this kind of farm, pigs are crammed inside tiny crates within large, dark buildings. They’re never taken outside, and when they’re about 6 months old, they’re slaughtered. But when the factory farm flooded, many of the animals, who had been left behind, floated out of the building, and had to swim hard to try and save their own lives. 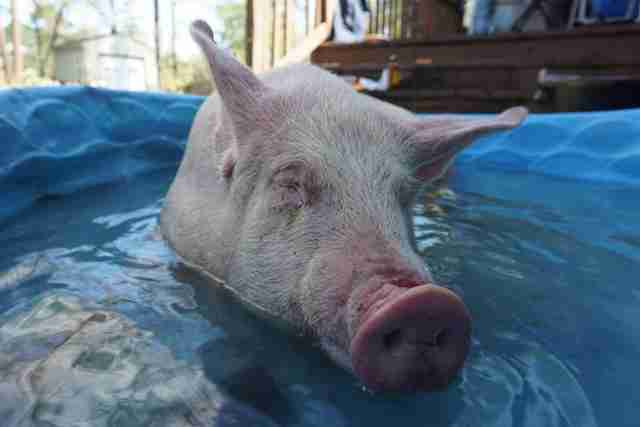 For most of the pigs, who weren’t used to getting any exercise, this was simply too much, and they ended up drowning or dying from exhaustion. 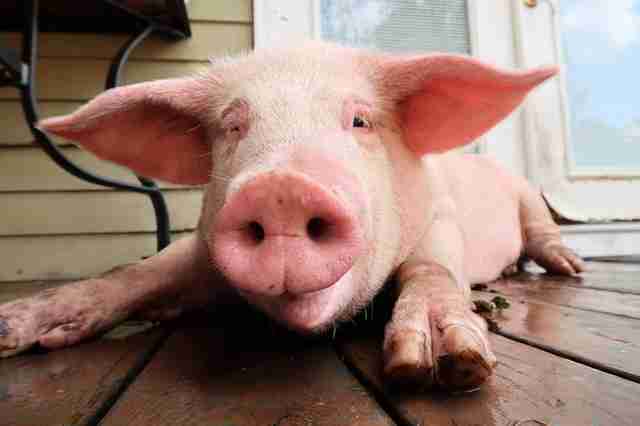 But the pig who turned up on Walls’ street was one of the lucky ones. 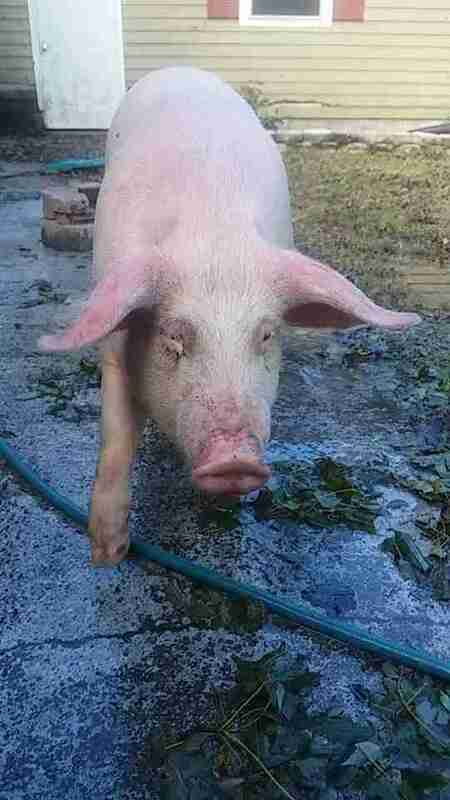 Walls named the pig Flo, initially thinking he was a female pig (he later discovered he was a male), and decided to do everything he could to look after him. He took Flo into the safety of his yard, and he gave him food and water. He also covered Flo’s skin with mud to try and ease the pain of the sunburn. Unfortunately, Walls couldn’t keep Flo on his family’s property, so Walls and his mom searched for a solution. They got in touch with Ziggy’s Refuge Farm Sanctuary in Providence, North Carolina, and cofounders Kristin Hartness and Jay Yontz agreed to take Flo. There was one problem, however: Many of the roads leading into Walls’ neighborhood were closed off, and they couldn’t get there right away. Hartness ended up finding a local family who’d keep Flo safe until she and Yontz could pick him up, and the family hurried to find a vehicle to safely transport Flo to their house. As everyone figured out these logistics, Walls never left Flo’s side — he stayed with him in his front yard, rubbing his belly and talking to him. The family arrived at Walls’ house around midnight, but the promised transport never arrived. So around 3:30 in the morning, Walls loaded Flo into his car, and drove him to the family’s house himself. 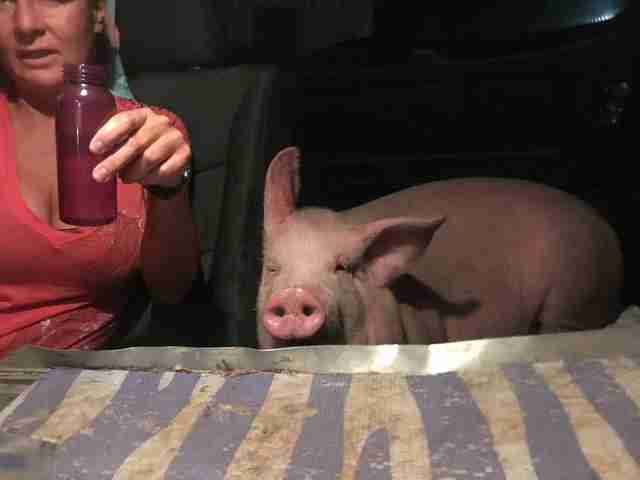 Then the family kept Flo safe until volunteers picked him up and drove him to the sanctuary. Hartness, Yontz and everyone else at the sanctuary became just as infatuated with Flo as Walls had been. But Flo was also really sick — he was struggling to breathe after taking in so much water, and he was overheating. Hartness and Yontz hurried him to a vet. But the next day, Flo had turned a corner, and he started “running wild through the yard,” Hartness said. Hartness and Yontz have several other pigs rescued from factory farms, and they’re amazed by their resilience and joy for life. Since Flo’s arrival, Hartness and Yontz have taken in several more pigs rescued from Hurricane Florence, and they’re working around the clock to make sure they all get medical care. As for Walls, he hasn’t stopped thinking about Flo, who changed his life in immeasurable ways. 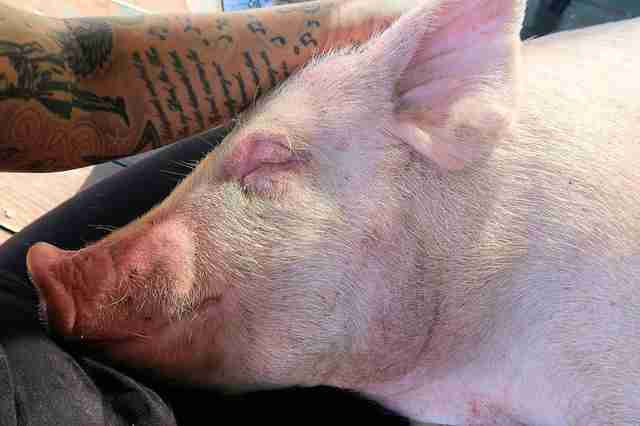 Before meeting Flo, Walls had never thought about the hard lives of factory farmed pigs, and he hadn’t considered himself to be an animal welfare advocate — but he now wants to do everything he can to help animals like Flo. To help Flo and the other pigs rescued from Hurricane Florence recover and enjoy their new lives at the sanctuary, you can make a donation to Ziggy’s Refuge Farm Sanctuary.